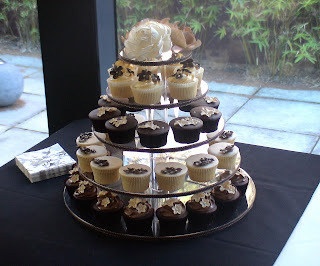 This Cupcake tower made for a 50th Birthday party includes Double Chocolate Cupcakes and Lemon Sorbet Cupcakes. Each flavour had two designs, one with a buttercream swirl + one with a fondant dome over a layer of buttercream. Elegant and chic, a stunning Birthday cake just for the grown ups. Your cupcakes are STUNNING!!! I love everything you do. Cupcakes look amazing, too bad you didn't add the recipe..